“No-one goes to work to do a bad job!” This quote, penned by legendary management thinker W. Edwards Deming, was introduced to us by a friend of LMK, process improvement and human factors guru, Keith Dorricott. In a recent LMK webinar, Keith discussed best practices for TMF metrics, and arrived at the conclusion that this quote rings true for the clinical trial industry and TMF creation and maintenance. The quote represents a positive view of the way individuals work within systems and challenges us to interpret poor performance as a sign of a poorly designed system rather than a symptom of laziness or incompetence. There is, however, one notable exception that comes to mind – the vile and villainous Count Olaf. You might have surmised that Count Olaf is a fictional character, and you’d be right. Count Olaf (played by Neil Patrick Harris in the newly released Netflix series) is main character and antagonist of Lemony Snicket’s A Series of Unfortunate Events, a series of thirteen books written under the pen name of author Daniel Handler. A Series of Unfortunate Events follows the tempestuous lives of the three orphaned Baudelaires: Violet, Klaus, and Sunny. After their parents’ death in a rather suspicious fire, the children are placed in the guardianship of their relative – Count Olaf. Count Olaf is soon revealed to have set fire to the Baudelaire home in an attempt to gain access to the Baudelaire fortune via the guardianship of Violet, Klaus, and Sunny. Unfortunately for all parties involved, Count Olaf’s ploy is not immediately successful and sets in motion the ‘series of unfortunate events’ that are chronicled in the Netflix show and over the course of the thirteen original books. The Path of Least Resistance: According to Count Olaf, money is, “the most important substance on earth besides applause and lip balm.” Count Olaf loves the easy money and the easy way out. It is this greed which inspires him to pursue the Baudelaire fortune. The Baudelaire fortune, according to Olaf, should at least provide him enough money to make it through until his acting genius is recognized. In the case of your TMF, it pays to recognize the path of least resistance as well. Although QC is essential to an inspection ready TMF, more QC activities don’t necessarily mean a better TMF. As part of a sound TMF QC plan, understanding the human factors that affect the TMF are as important as choosing an eTMF system or defining expected documents. Establishing and maintaining an effective TMF is difficult enough without processes that antagonize your team. QC is only useful when it provides the opportunity for learning and improvement. Fighting Fires: Count Olaf loves to start fires. From the Baudelaire Mansion, to the entire Caligari Carnival, and even Heimlich Hospital with the patients inside, Olaf has no qualms about setting a match to the people or places that stand in his way. For those who are one step behind Olaf’s evil deeds, it can seem like life is a constant rush from one fire to the next. Is ‘fighting fires’ sapping your team’s TMF bandwidth? Too often, the TMF takes a backseat to other aspects of the trial that are more immediately pressing. But when procrastination takes hold and avoidance behavior becomes entrenched, the TMF can suddenly become a catastrophe—and can delay delivery of the trial’s data or even impact regulatory submissions. Although TMF procrastination can be caused by a myriad of factors, an early commitment to the TMF and sustainable QC processes are essential to avoid a late-stage ‘TMF conflagration’. A Bad Actor: Count Olaf is a master of disguises and trickery, but his schemes are so successful because of how willing people are to fool themselves. Olaf’s most successful strategy is flattery: finding a person’s hidden insecurity or secret longing. Although Olaf has never had much success gathering applause from a crowd, his acting skills do come in handy for masterfully manipulating those around him. Are your TMF stakeholders mindlessly acting out their part? One common thread often observed when diagnosing a troubled TMF is a lack of stakeholder empowerment. Although pre-planning and well-defined processes are an important part of a QC system, one must approach every clinical trial with the expectation that unique circumstances will arise. Does your team feel comfortable changing course when a process is broken, or will they pretend like everything is fine until it is too late? The investment in a flexible and supportive team culture pays excellent dividends. Hopefully your experience of the TMF is not filled with secret societies, henchmen, and the gloom that seems to follow the Baudelaire orphans like a dark cloud. 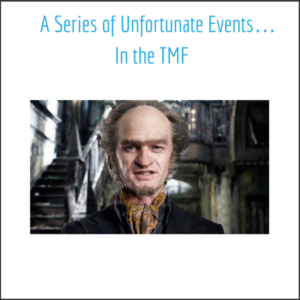 Although we can’t guarantee that A Series of Unfortunate Events will come to a happy ending, we can promise that working with human nature (instead of fighting against it) is a proven way to improve your TMF. Yes, there is a bit of Count Olaf within all of us, but there is also an innate desire to take on a worthwhile challenge and produce work that makes everyone proud. A healthy TMF culture and smartly designed processes can bring out the hero in everyone.